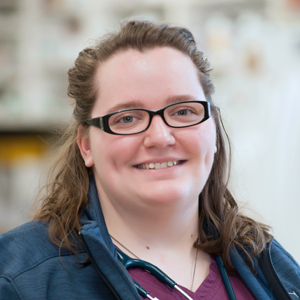 Chelsea graduated from Animal Behavior College as a Certified Assistant in 2014 and then entered the Veterinary Technician Program at Macomb Community College in persuit of her Associates degree in Applied Science for Veterinary Technology. Chelsea began working in the veterinary field in 2013 as a Veterinary Assistant, and added additional experience in general practice and an all cat practice before joining AEC in 2016. Chelsea loves rooting for a patient's success in getting better. "I love to get patients to start to eat with all the good food we offer (its so rewarding). I also love anesthesia, and the rush and diversity of emergency medicine. I've always loved animals, they are not just pets - they are beings that care and love just like we do." Chelsea has an older Pit Mix at home named Marley, a DSH Tortishell cat named Fae and a DMH cat named Ginger.